My Tattoos represent my passion for the North American history including North American Fur Trade (1492-1800), The Golden Age of Piracy (1690-1730), and The French & Indian Was (1754-1763). I have been reenacting since `986 in Orange County, California, starting out when I was 16 years old. I went to my first Native American Pow-wow and everything about me changed. Reenacting history evolved into what I do today. I went from Indian Pow-Wows, which were spiritual and I enjoyed but felt weren't enough. I heard about Black Powder Muzzle Loading Rendezvous and went to my first one in 1989. The passion grew from there and I moved to Reno, Nevada in 1993 and my Rendezvous experience grew within the hobby. As I grew older my love for history went from buck skinner to Lewis & Clark to Late Colonia to French and Indian War era. I traveled to many states and attended many National Rendezvous. In 2003 I moved to Florida to get away after a divorce and I did a few Rendezvous events in the Southeast area. After learning that there were a few souls who reenacted the Golden Age of Piracy in the Tampa, Florida area, I got hooked. Since most of my gear related to more of a 1750 style encampment, it seems to be my calling. 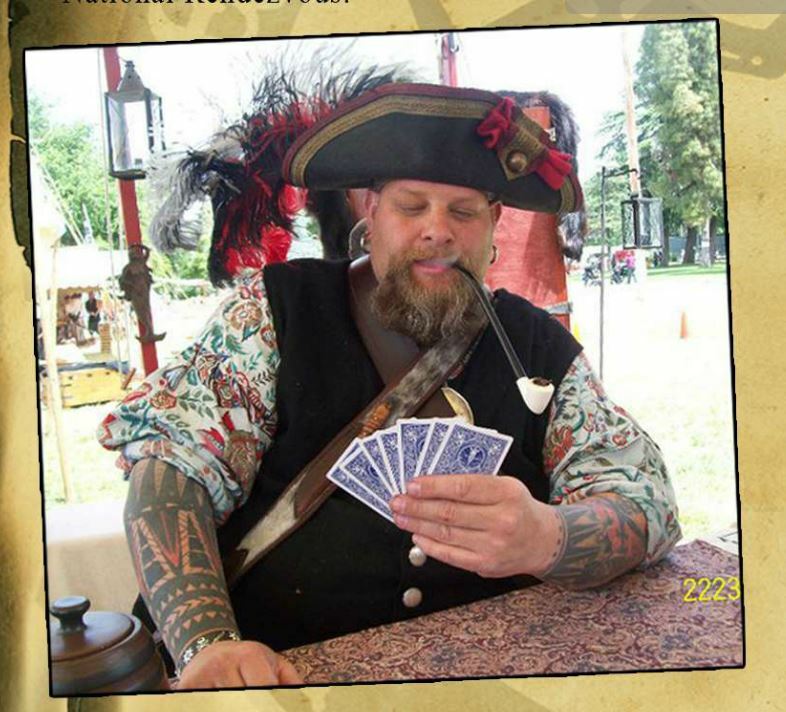 After a year and many East Coast fairs, I moved back to Reno and traveled to many Pirate Festivals as I still do today. I switch out now and do both Rendezvous and Pirate Festivals. My tattoos represent a bygone era of important history that did exist. I am sleeved; my legs have many tattoos also. The majority of my tattoos were done by artists Zach and Lori Mueller, owners of Distinct Ink Tattoo in Carson City, Nevada. 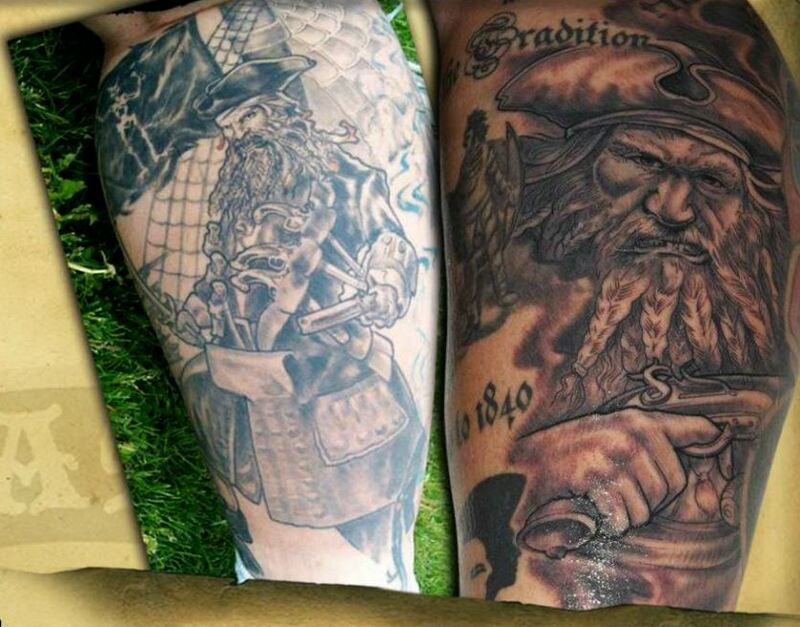 I have a collection of maritime art on my body, including Blackbeard, a carronade canoon, map of the Caribbean, nautical rose, a jolly roger with flames, cannonball, and a pirate wench. I started back in 1995 when I purchase my first tattoo. Just like reenacting, my passion grew with the tattoos. It's an addiction I have like many others get, but it's an art that has been around since man walked the earht. Tattoos are ongoing experience like reenacting, and it's always changing and evolving. I attend many festivals and have a field tavern pirare encampment that I set up which includes a boucan meat feast, may Dutch oven dishes, a variety of rums from the Carribean. Come sit and enjoy my hospitality and let's enjoy life together. I look forward to meeting new souls at every festival I do and seeing old mates as well. 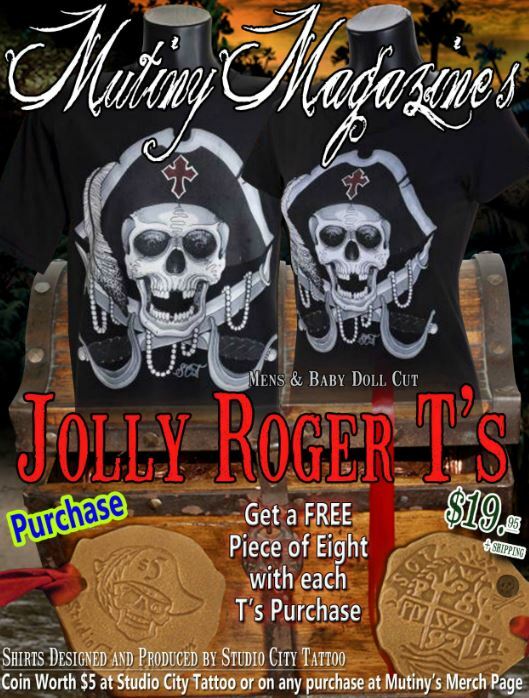 MUTINY MAGAZINE’s name and its content are trademarks of and © Mutiny Magazine TM 2011-2018.